Suzy Williams presents her mechanics and containers for flower arrangements program during the March meeting of the Gallipolis Garden Club. 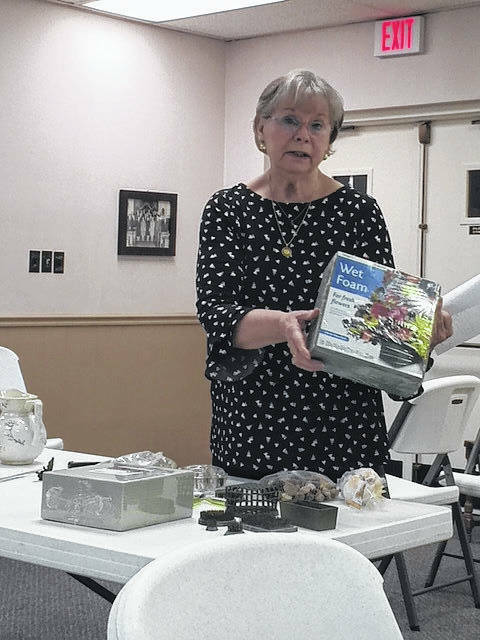 GALLIPOLIS — Suzy Williams presented a program on mechanics and containers for flower arrangements at the March meeting of the Gallipolis Garden Club. Co-hostesses for the meeting were Carolyn Berry and Lily Holley. The next meeting will be held on April 12 at 7 p.m. in the Fellowship Hall of the Presbyterian church. Anyone interested in attending or joining the Gallipolis Garden Club is urged to contact Club President Suzy Williams or stop by the next meeting. Submitted on behalf of the Gallipolis Garden Club.